Welcome. Tuloy po. 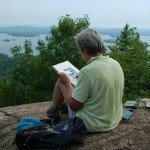 I’ve added a new thread to my blog entitled Art + Nature = Happy-making. 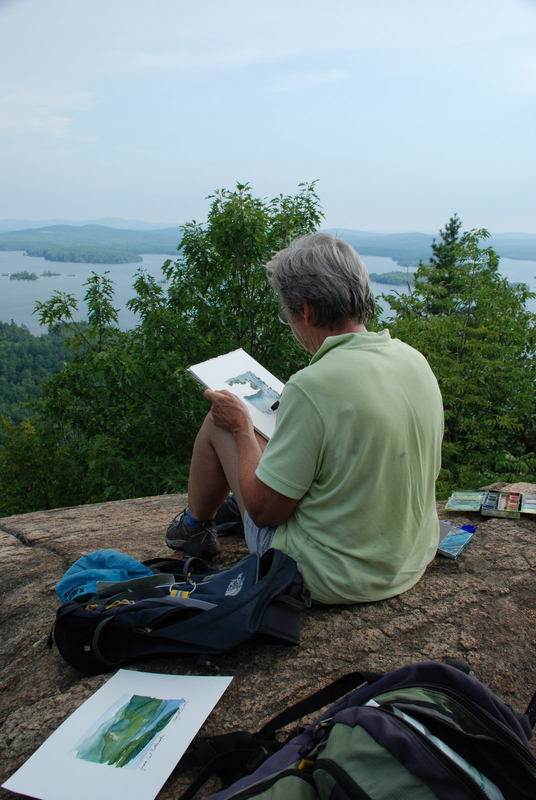 From time to time, I’ll be featuring interviews with writers, artists, and musicians whose creative work connects audiences to the wonders of Nature. I’m excited to share this first one. Children’s author Sallie Wolf grounds her sketches, drawings, and poetry in her keen nature observations: the waxing and waning of the moon, bird migrations, songs, and nesting. Her work has been exhibited at the Adler Planetarium, University of Chicago, Woman Made Gallery, and venues around the Midwest and East Coast. We’ve been in creative communities together for the last 10 years and I feel lucky to be able to watch her in action. Sallie’s a true Renaissance woman with a flair for combining science and art. Chicago artist Sallie Wolf’s charming children’s book The Robin Makes a Laughing Sound (Charlesbridge, 2010) invites kids to get to know some of their noisiest neighbors – the birds! Young readers meet hungry baby starlings, strutting seagulls, a great horned owl, ruby red cardinals in the snow, and, of course, a laughing robin. The book’s design, by Micah Bornstein, is awesome. 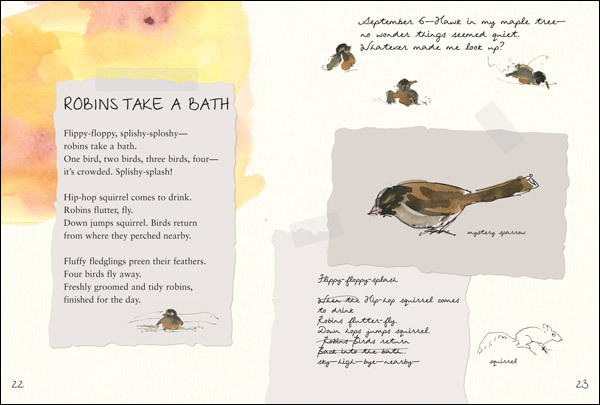 You feel like you’re standing right inside one of Sallie’s journals: warm water-colors, sketches, playful poetry, nature observations, and bird lists. She beautifully brings together her passion for birds and journaling. Great for kids 8 to 108. 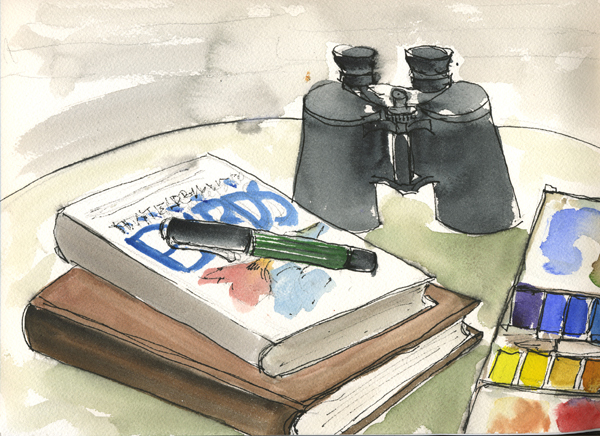 MGB: First things first: What is a birder? SW: Good question. A birder is someone who is interested in birds, especially someone who watches the birds he or she sees outdoors. Some birders maintain feeders in their yards to encourage birds to come closer. Some birders make field trips to special places to see birds in their habitats—bald eagles along the Mississippi, or a trip to see Sandhill Cranes, for example. 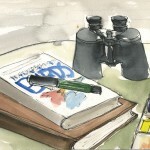 MGB: What is fun about bird-watching? Why do you do it? SW: When I moved from the East Coast to the Chicago area I moved from a semi-rural suburban setting with remnant woods and farms, winding roads, and hills to a flat, urban grid. Bird-watching in Chicago became a way of making Chicago and the Midwest my home. I put feeders in my back yard and I had goldfinches and chickadees and cardinals in the wintertime as well as the migrants passing through in the spring and fall. Birds became more and more important to me, reminding me that even in an extremely urban setting, Nature is at work. We are a part of Nature, no matter how we alter the environment. MGB: How do you recommend someone start out bird-watching? Do you need special equipment to become a birder? SW: The more you pay attention, the more birds you will find–in parks, sitting on wires, perched on chimneys or rooftops, pecking along the edge of the road, feeding in yards. If you put up a bird feeder and keep it supplied with bird seed you will attract more birds, though not necessarily more different kinds of birds. I have tons of house sparrows that eat me out of house and home. As I’ve altered my garden to include more native plants I’ve improved the diversity of birds in my yard. As you get more interested in birding you may want to buy a pair of binoculars to help you see birds who are too shy to come out in the open. A good field guide, such as the Peterson Field Guide, is helpful for learning to identify birds. I like to keep track of what birds I see in my journal, compiling a list each day. I do this to become familiar with what birds I might expect to see at what time of year. MGB: What species can families look for in the Midwest? SW: There are quite a few species in the Midwest, depending on the time of year and the habitat around you. Cardinals, crows, blue jays, starlings, pigeons, house sparrows, mourning doves have adapted to urban and suburban living quite well and are found year round. Gulls and Canada geese are also common. If there are big trees and some planted areas, chickadees and woodpeckers can be found. Other summer nesters are cat birds, chimney swifts, chipping sparrows, Coopers hawks, grackles, and many others. The spring migration brings a wide variety of warblers, sparrows, thrushes, and all sorts of birds moving through the Midwest. The junco comes to the Chicago area in the winter from its nesting areas in the far north and on mountain tops. There are hundreds of different species to be found in the Midwest if you know when and where to look. MGB: What’s your favorite bird to watch? Why? SW: This is almost like asking, “Which of your children do you like best?” But there are certain birds which I get a real kick out of. I love the juncos which come in the winter. They are very beautiful birds in an austere grey and white way–very elegant coloring. I also love the robins. They are the first bird I learned to identify. They signal that spring is really coming. They have a pretty song and interesting calls, such as the laughing sound which inspired the title of my book. Their eggs are a beautiful blue. 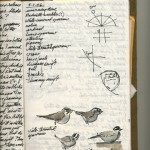 MGB: The Robin Makes A Laughing Sound shows journal entries where you’re trying to identify birds. How can you tell birds apart? What do you look for? SW: It is helpful to learn which birds are likely to be in your area at which time. I learn this from looking at bird lists handed out by the Audubon Society or the Arboretum, some museums, or the Botanical Gardens. I also talk to other birders about what they are seeing. Size and silhouette are key to identifying birds. Is it bigger than a robin? Bigger than a crow? Small, like a sparrow? Then you look for the most distinguishing marks–is the breast clear or striped? Does it have any stripes on its head or around its eye? Does it have wing bars? I’ll make a note of any identifying marks–a patch of white, a pattern of stripes on the head—and maybe sketch the bird in my journal. That helps me remember what I saw and sometimes I am able to figure out its name long after I saw it. MGB: Your journal is full of questions like: “Do owls migrate?” and “where do birds sleep at night?” and “who made that sound?” Did you get answers to your questions? SW: I may be better at asking questions than answering them. I checked the Peterson Field Guide to find out if owls migrate. The answer is some do and some don’t. I’m still not sure where birds sleep at night, once the eggs have hatched and the babies have left the nest. And as to who made that sound–I think it turned out to be a squirrel scolding me. MGB: Your artwork shows a lot of birds and phases of the moon. How does observing nature inspire your creativity? SW: One effect of drawing from observation is that my eyes get sharper and sharper at picking out details. I see things differently now than I did before I began to draw. I hope I am building a stronger visual memory. Before there were photographs, copying machines, TVs, and computers, before books were plentiful, drawing was the best way to convey what something looked like, and people’s visual memories were much stronger than today. Another inspiration I get from nature has to do with color. Insects, birds, sea shells, fish, animals, and flowers have the most amazing color combinations. I have always been attracted to color and I love to observe and paint the patterns I see in Nature. MGB: Some artists say that when they draw something, they “know” it better. Writers often feel the same way. How does drawing and journaling about birds make you feel and think about them? SW: Over time I’ve begun to recognize shifts in behavior, so that not only can I recognize a bird, but I’m becoming tuned in to its life cycle—this must be courting behavior; or, I bet it has a nest and babies nearby; or, these birds are gathering together to migrate soon. My drawing and writing, my close observation, have taught me to trust my instincts. I can teach myself a lot just by paying close attention and spending time looking with my own eyes. I do not need a book or the internet to tell me everything. MGB: Is there anything special you’d like readers to know about your work? SW: I hope that when readers look at my book, The Robin Makes A Laughing Sound, their response will be something like, “I can do that!” Better still, maybe they’ll say, “I want to do that!” You can draw what you see and care about–it doesn’t have to be birds. You can make observations about what you are interested in. You can spend time letting your words and drawings grow in your journals. I have been drawing the same things over and over again for a long period of time. Just the way you get better and better at riding a bike the more you practice, you also get better and better at drawing, better and better at writing, better and better at seeing, even. It is the practice, not the end product, that is of value. 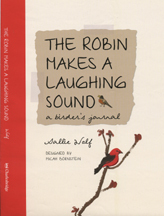 MGB: One final question: The title of your book is The Robin Makes A Laughing Sound. What is that sound? SW: Oooh–I wish I could write that sound. I can’t even make that sound. I was walking home one day and heard this noise. I stopped, looked up, searched a tree until I found the bird, a robin, which was making the sound. And then as I continued on my walk I began to think how could I describe that sound? It makes me think of my neighbor’s guinea pigs, the little, not quite squeaky sound they make. It makes me think of the word chuckle. Chortle? It is a quiet, subdued, repeated sound, not a song, not a whistle, that robins make to alert other birds. As I walked I discovered the first line of the poem — “The robin makes a laughing sound.” The rhythm of that line matches the rhythm of my walking gait. I continued to compose the poem all the way home. 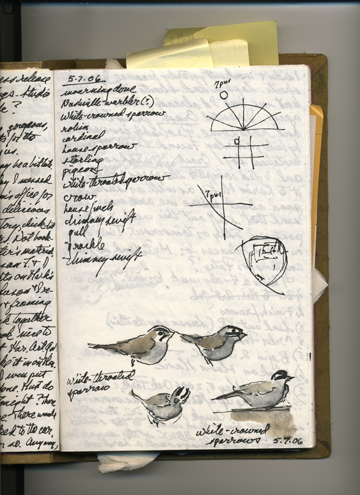 MGB: Thanks, Sallie, for your time, your art, and for sharing your birding and journaling tips! Illustrations © 2010 by Sallie Wolf from The Robin Makes a Laughing Sound.